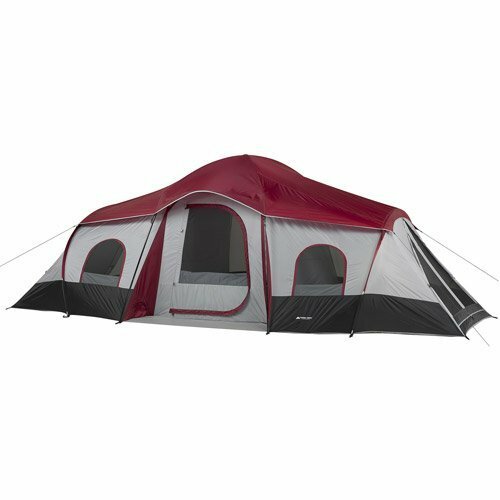 Ozark Trail Family Tent is a big tent, fitting 10 people and 3 queen size beds. It’s suitable for a family vacation, an excursion with a large group of friends, or even just a backyard getaway. As an owner of the tent, I can say that the Ozark Trail 10 Person Tent is one of the best family tents. There are several considerations when buying a tent. If you want to learn a little more about these general considerations, you can read the ozark trail tent reviews. In this article, I will focus specifically on the Ozark Trail 10-person 3-room XL Family Cabin Tent. Personally, I recommend this tent if you have a big group. Last summer, I took my immediate and extended family (3 kids, 3 relatives, myself, and my wife) camping in Yosemite. Since the tent fits 10 people (and we only had 7), there was a lot of room to spare. Extra room is nothing to complain about, but if you’re looking for something a little more compact, you can check out our other reviews. The tent was very easy to assemble, and comes with a convenient carrying bag. The instructions were a little confusing at first, but we eventually figured them out. Overall, I’m a huge fan of the Ozark 10 Person Tent. If you like to go on a camping trip with your family (or two families!) or with a group of friends, “Ozark Trail 10-person 3-room XL Family Cabin Tent” is a great choice.